Yep, Die Hard in the White House. Die Hard in a bland location has become such short hand in this day and age you don’t even need to make to the end of the trailer. Who knew protecting the White House from armed insuregents could be so boring. 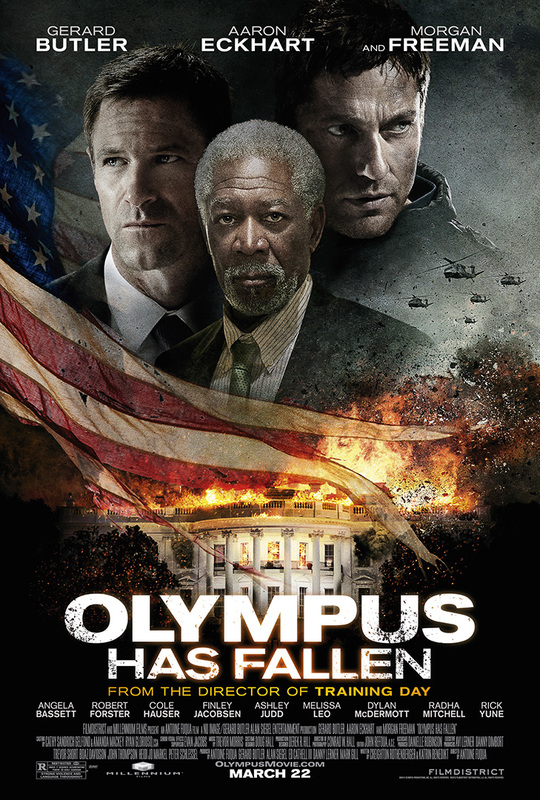 Olympus has Fallen stars Gerard Butler as disgraced secret service agent Mike Banning that had the unfortunate duty of saving the President played by Aaron Eckhart but not the First Lady played by Ashley Juddd and has been sitting on a desk duty at the Treasury until one day North Korea decides enough is enough and pulls a Red Dawn on the capital on July 5th. A slew of supporting characters like Radha Mitchell playing Mike’s wife, Angela Bassett playing his ex-boss, Dylan McDermott playing a retired secret service agent and Morgan Freeman as the speaker of the House should round out a great movie ala Air Force One. Instead, we can diet Die Hard with Rick Yune playing essentially the same character he played in Die Another Day. Olympus has Fallen has a wonderful first act so long as you don’t mind the fact a C-130 rolls up the Potomac, dispenses with 2 F-22 and then strafes innocents around the Mall until ten minutes later it decapitates the Washington Monument and turns the South Lawn into a inferno. I’ve ruined nothing of the movie for you since the first act essentially is shown in the trailer. This is not necessarily a good thing since Cowboys and Aliens blew their wad all over the first act too and saved nothing for the 2nd or 3rd acts. Through a series of sloppy writing, the bad guys take the President in his own bunker and proceed to issue demands and shoot people if they don’t get what they want. Moving the 7th Fleet and pulling troops out of the DMZ for starters. All of this is pretty mundane until they start cracking the destruct codes for the nation’s ICBMs. Unfortunately, we’ve seen this in Salt and even the first GI Joe movie at least until Banning starts by rescuing the President’s son and getting him to safety. This underlying storyline actually created some tension/conflict until the boy makes it to safety and we come back to Kang played by Rick Yune. Kang and his faceless minions (no joke they have no plot only to tussle with Gerard) take over the White House fairly quickly and once in the bunker they lose their teeth a bit since there isn’t enough tension between Banning and his arm chair superiors at the Pentagon. There is no finding a comrade dead in the elevator ala Die Hard. No vendetta for older brother to avenge younger brother’s death type of thing. Kang’s demands are really one note and that’s unfortunate because your hero is only as good as your villain. I half expected Radha Mitchell’s character to be kidnapped by Kane’s crew but that lovely idea is dropped along with why Dylan McDermott’s character turned traitor and essentially folds like a cheap suit under pressure. The middle of the movie is too dark for it’s own good and I don’t mean the plot. I mean the lighting. Did DC run out of spot lights and the White House’s emergency generators fail? There’s moody dark X-Files lighting and then there’s no lighting at all and Olympus unfortunately goes with option 2. In the end the movie loses a lot of the shock and awe so when the president’s supporting cast is blown up at the end of the movie as a diversion it doesn’t have the same effect the superior scene of blowing the roof in Die Hard. I keep coming back to Die Hard not because every other reviewer has done but because most of the scenes are pulled from the touchstone and doesn’t allow any wiggle room. The final verdict: Wait for this to arrive on cable or rent it. This entry was posted in Movies, Movies, Reviews and tagged movie reviews by RK Bentley. Bookmark the permalink.